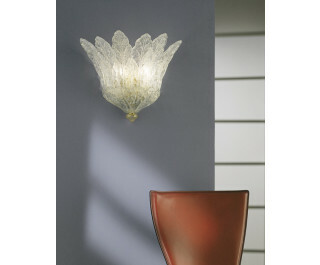 Cast glass ceiling lamp with grit characterized by crystal color and gold color frame. It is enriched by its refined blown glass in amber color with transparent rigadin effect with 24K gold slivers. its charming design is the perfect complement to your classic environments, such as bedroom, living room, drawing room, hall, studio, guests bedroom.